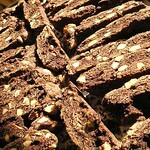 Double Chocolate Almond Biscotti: Step by Step - Do You Know The Muffin Man? 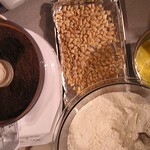 The chocolate and almonds need to be chopped. I sifted the cocoa powder to get rid of clumps. Forming the logs is tricky because the dough is very dry. You want them very firm as trapped air will expand and cause cracks. 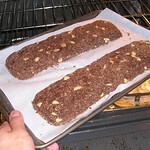 After the first bake, the logs are sliced and baked again to dry and crisp them. 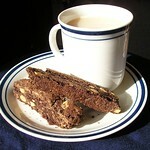 Ready for dunking in coffee, vin santo or tea. Notes: Logs broke while slicing after first bake. Try slicing while still warm.